Carcharocles megalodon collection from the Gatun Formation. Researchers from the University of Florida have announced the discovery of a 10 million year old Megalodon nursery area located in Panama. In a paper published in the research journal PLoS ONE they present the analysis of over 400 fossil Megalodon teeth collected from the shallow, marine Gatun Formation. These fossil Megalodon teeth in this collection are all surprisingly small, representing very young juveniles of the species. Analysis of the Megalodon teeth determined the size did not relate to tooth position in the jaw or the size of the species during the time period. “Our study suggests the specimens represent mostly juveniles with lengths between 2 and 10.5 meters (6.5 to 34.5 feet),”, researcher Pimiento said. While several other areas have been suspected to represent Megalodon nurseries including the Bone Valley region of Florida and the Calvert Cliffs in Maryland due to the high concentrations of small teeth, this study maybe the most in depth analysis to date. Although they were big babies, at 7 to 13 feet, young megalodons would have been vulnerable to predators, mainly other giant prehistoric sharks. Modern juvenile sharks find food and safety in shallow-water nursery areas, where bigger sharks that would prey on them can’t swim. Scientists thought megalodon also used nursery areas, due to finding areas with juvenile shark fossil teeth nearby fossil marine mammals. A discovery in Panama gave scientists from the University of Florida confirmation of this belief. The scientists studied 400 megalodon teeth collected from the Gatun Formation, an area where the Caribbean and Pacific met during the Miocene. The teeth were surprisingly small for the gigantic species. This suggested they were juveniles, but wasn’t conclusive. To determine for sure they were juveniles required thorough analysis. First, the scientists had to make sure they weren’t small based on their position in the jaw. They did that by comparing the teeth from these fossils to those from fossils elsewhere of megalodon in different life stages. The scientists also conducted a review to make sure the megalodon weren’t simply smaller during the time period the fossils came from. Based on that analysis, they concluded the teeth were from juveniles and the concentration suggests a nursery area. Although other nursery areas were suggested previously, this was the first rigorous analysis to confirm an area as a megalodon nursery. 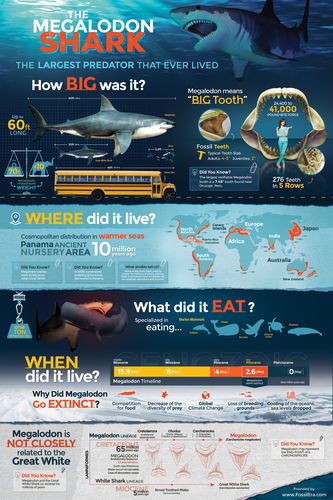 Megalodon was the biggest fish, and shark, to ever swim in the seas. Because of the limited fossils, scientists don’t know for sure how big they got, but think they got to be more than 50 feet long, possibly closer to 60 feet. The large adults were bulky, too, weighing possibly weighing 50 tons or more. That’s more than three times as long and twenty times as heavy as the Great White Shark. Almost nowhere in the ocean was safe for other fish. Megalodon teeth have been found nearly everywhere, on every continent except Asia and Antarctica. They used those teeth to eat anything they wanted. Their preferred meal was probably whale; larger sea turtles may have served as snacks.